Recently, we had hardwood flooring installed in our dining area. 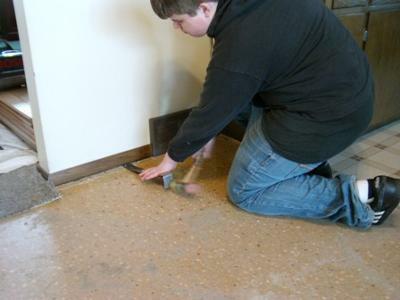 Previous to the installation, we had carpeting with a linoleum and plywood base. Our Floorwright, Jerry Adamsson, re-worked the base and installed a beautiful patterned floor. Solid-- no squeaks and perfectly level. The sanding and finishing are exceptional. Color is exactly to our specifications. Preparation and clean-up were excellent. All of this work was done by a reliable,honest and dedicated professional. Jerry will be doing some additional work in our home also. 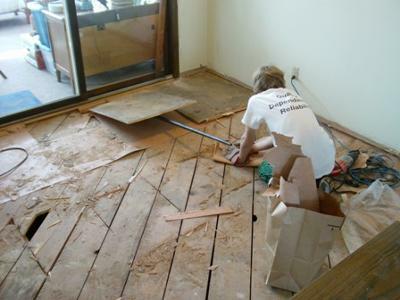 We heartily recommend Jerry Adamsson for any hardwood floor work. We will be telling our friends also. Thanks for your kind words and I look forward to refinishing the rest of the house. 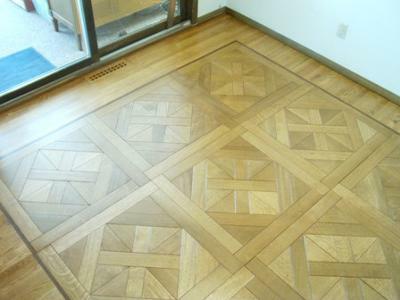 The field of this wood floor pattern is quarter-sawn White Oak in a Marseilles design. The dark pinstripe is American Walnut. look like nothing ever happened. I should also mention for other readers that extra ShadeMaker Brand Stain was mixed and left for the next phase. Floorwrights Install Wood Floor Pattern videos are available for viewing on The Wood Floor Conservancy's YouTube Channel. You mentioned how flat and quiet your new floor is. Especially of interest to you might be footage of all the sub floor prep that went into your floor to make it that way. Congratulations on taking me up on the table pad idea. 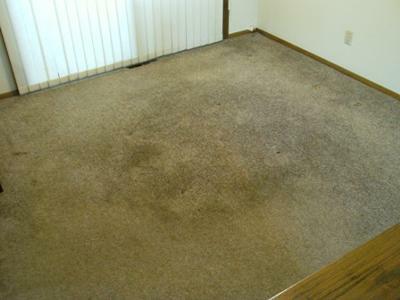 "let's pull the carpet in the dining room, put in a wood floor and get a nice area rug for under the table." I think you'll find this wooden area rug to be much more washable!